When you’re analyzing investments, the trading range is a valuable analytical tool. The average trading range is the average distance between the high and the low over a specified period of time. You can calculate the average high-low range on a piece of paper, a spreadsheet, or by using charting software. The average trading range is one of the best tools you have for keeping your sanity and perspective. If you know that the average daily trading range is $3.20, the most you can expect to make on this security in a single day is $3.20, and that’s assuming that you could buy at the exact low and sell at the exact high — and assuming that it’s an average day. In regular bar work, say that you are merrily averaging your daily high-low ranges and suddenly you have a gap. You need to account for that gap or you will be literally missing something. This figure displays the problem. On Day 1, the high-low range is $2. The next day, the price opens gap up, but the daily range is the same $2. Therefore, the average range for the two days is also $2. Looking at the average range alone, without inspecting every bar and every space on the chart, you wouldn’t know that the gap occurred. But you need to account for the gap because it often precedes a longer-term change in the range, which is what you’re looking for. If you measure each day separately and average those numbers, the range looks the same from day to day. For the first two days in the preceding figure, though, the range is actually from the low on Day 1 at $1 to the high on Day 2 at $7 — or a $6 range. Just looking at the average range on a numerical basis, you’d think that the range had contracted — exactly the opposite of what really happened. If you want to make a trading decision based on a change in the average trading range, you need to adjust the averaging process to account for possible gaps. Start at the most important component of the price bar: The close. As a rule, to calculate the true range today after a gap, you start from the close on the day before and end at today’s high. You are substituting the first day’s close for the second day’s open in order to incorporate the gap. This figure shows the new measurement. Pretend that the close on Day 1 was $3, or $2 over the open at $1. Subtracting that close from the high on Day 2 at $7, you get a true range of $4. 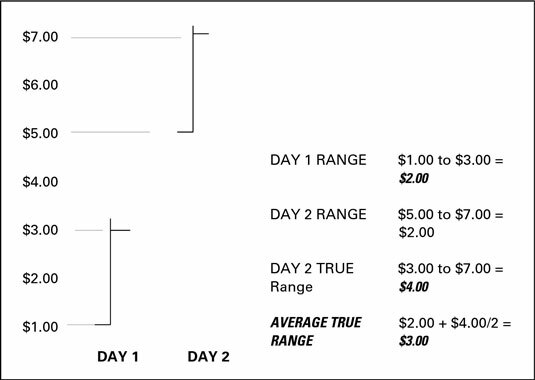 Averaging that with the original Day 1 range of $2, you get $3, the average true range (ATR). 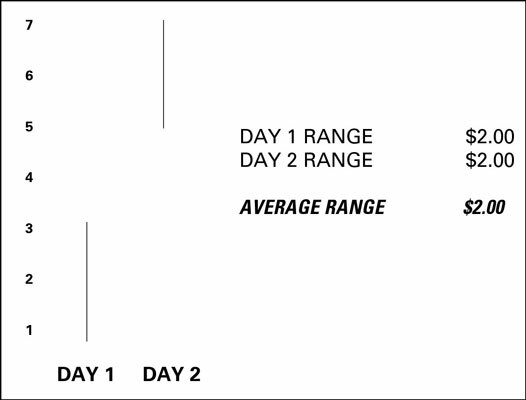 If Day 2’s price bar gaps downward, you incorporate the gap by measuring from the close on Day 1 to the low on Day 2. The ATR can be hard to use, in part because the ATR line can be choppy, it doesn’t track the trend slope, and it in fact can diverge from it (as shown in this figure). Plus, the ATR requires bar reading to get it right. 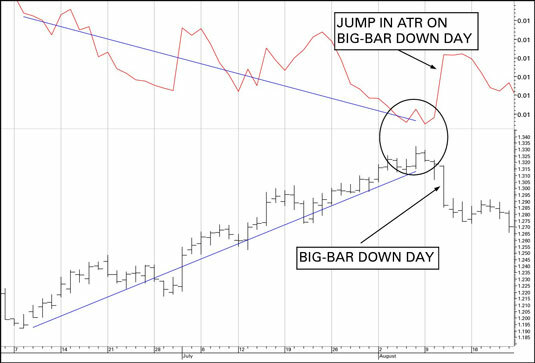 By the time you get the big-bar down day, you already know this trend is ending. But don’t neglect ATR as a warning indicator — sometimes it’s the only warning you get.